The corruption trial of former Malaysian prime minister Najib Razak on charges linked to a multibillion-dollar scandal at state fund 1MDB will start next week after a delay of nearly two months, his lawyer said on Thursday, Reuters reported. The postponement was seen as a blow for the government of Mahathir Mohamad, which reopened investigations into the alleged theft of $4.5 billion from 1Malaysia Development Berhad (1MDB) after winning elections last May and vowed swift justice. Originally set to begin on Feb. 12, Najib's trial was postponed because of appeals over procedural matters raised in pre-trial hearings. It will now begin on Wednesday, his lawyer, Farhan Read, told Reuters in a brief text message. Najib has pleaded not guilty to seven charges of criminal breach of trust, money laundering and abuse of power over a suspected transfer of 42 million ringgit ($10.3 million) into his bank account from SRC International, a former 1MDB unit. 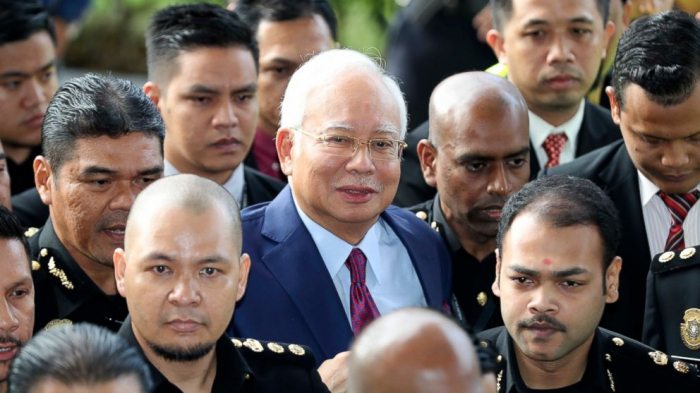 The trial is the first of several criminal proceedings Najib is expected to face over the scandal, and the sum involved is a fraction of the $1 billion investigators allege made its way to his bank accounts. He faces years in prison if convicted on a total of 42 criminal charges, most of them linked to 1MDB. U.S. prosecutors say money stolen from the fund went to buy a private jet, luxury real estate, artwork by Picasso and Monet, as well as jewellery for Najib's wife Rosmah Mansor, who has also been charged.